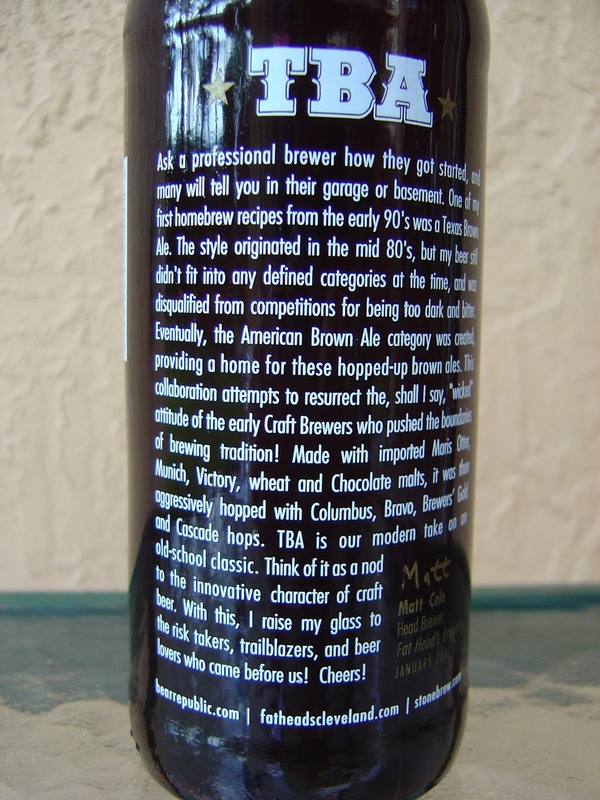 Today I'm drinking TBA Extra Hoppy Brown Ale brewed by Stone Brewing Company in Escondido, California. 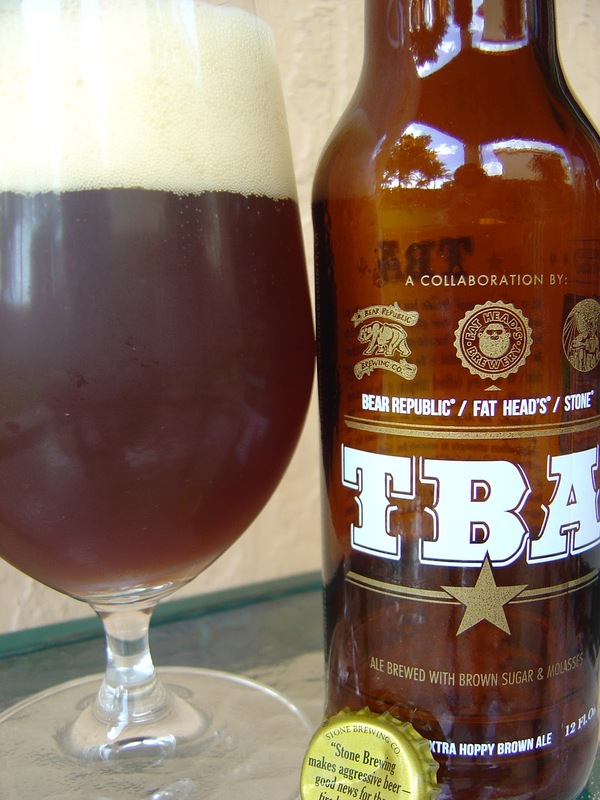 This beer is part of Stone's 2012 Collaborations series, being brewed with Bear Republic and Fat Head's Brewery. The story on the back of the bottle, written by Fat Head's Head Brewer Matt Cole, tells the story of how he made his first TBA, or Texas Brown Ale. This TBA attempts to recreate that beer, but with some twists. In fact, the front label lets you know that it's brewed with brown sugar and molasses. "Drink Fresh. Do Not Age." Nice aroma--brown sugar and a little nutty, while also showing off some orange citrus and hoppy floral characteristics. Flavors are malty to start, plenty of brown sugar with a light roast. There is even some smoke and a savory aspect front and center. Light caramel accents come as well. Simultaneously, you will taste a citric orange and earthy, grassy, hoppy kind of answer. A little spicy as well. Carbonation is prickly and fairly strong. The 7.1% alcohol is well incorporated but makes the flavors really pop out. Interesting and complex, one of those "drink it for the crafty idea and memories" kind of beers. Nice flavors and not bad. The finish is a bit dry with a pleasant aftertaste. I was not really a fan of this one. I mean, it wasn't bad and had some good flavor, but does everything seriously have to be hoppy? I mean, I understand it's Stone and Bear Republic (I've never had anything from Fat Head and it seems like they were the head guys for this one) but geez.